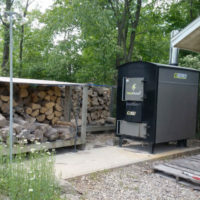 Wood heat plays an important part in ones energy cost reduction. If you have the wood resource why let it rot away. I have operated one for 3 seasons now. We sell the Heatmaster line of Stoves both convential and the new G Series Gasifacation stoves. We are updating the website as we speak so check back for more info on the Heastmaster line. The wood heat system lends itself to a homeowner doing a substantial amount of the installation and we will work closely with you to complete the project.